Buy Right Windows offer quality roofline services in Sittingbourne, Chatham and Maidstone. 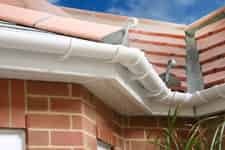 Our services in include the replacement of Fascias, Soffits and Guttering. We offer high performing, low maintenance products to protect your house and roofline from damage which is often caused by damp. Our innovative roofline products are highly durable and weatherproof. Our uPVC roofline products include Fascias, Soffits, Bargeboards, Guttering and Cladding. Your roofline is an important feature of your home and needs to be maintained to ensure your home is weather tight. Our selection of roofline products in Sittingbourne, Maidstone and Chatham will provide you with the quality protection your home needs. 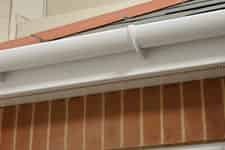 Our guttering and downpipes feature Gutterguards to keep them debris-free. All our Soffits provide excellent ventilation, allowing air to circulate, actively reducing the risk of rot. Replacing your roofline not only enhances your home protection but also enhances overall aesthetics. Soffits and Fascias play a key role in the appearance of your property. A neglected roofline won’t be adding value to your property. A roofline repair or replacement will instantly enhance your property’s looks, giving your property a cleaner and fresher appearance. Our Fascias, Soffits and Guttering will help maintain a strong and durable roofline. Our roofline products are manufactured using a combination of high quality uPVC materials. They are designed to complement all types of property, especially our successful range of windows and doors. All our roofline products are covered by a 10 year guarantee against yellowing or discolouring. You can be assured of quality workmanship as well as quality, durable products. For top quality roofline products, installed by our experts at competitive prices, why not contact us today! Find out how affordable our roofline services are by getting in touch with our friendly team. You can use our online contact form to ask any questions or arrange a visit, or if you prefer please give a call on 01795 427 222. We’re waiting to hear from you.